SL Residential was hired to complete this “fractured-condo” project. 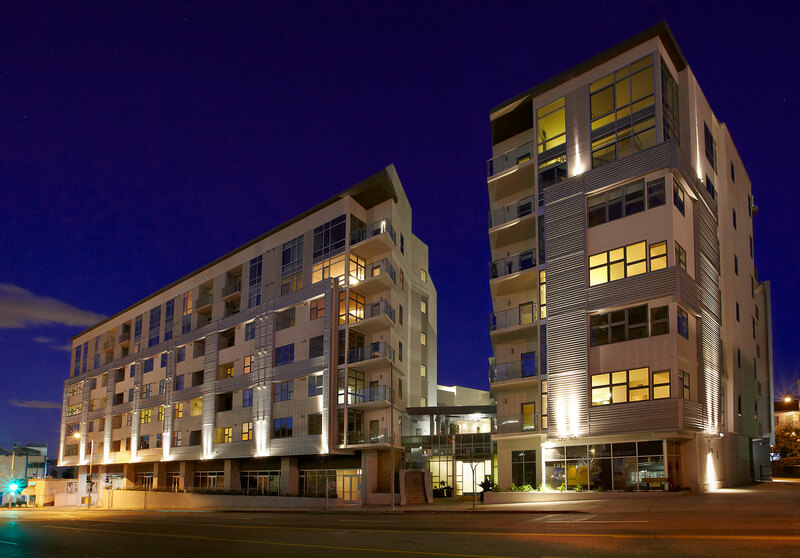 This urban residence consists of three podium style, Type 1 construction (concrete) buildings. Building A is four-stories consisting of 27 units; Building B is five-stories with 75 units; and Building C is six-stories with 78 units. The 180-single-family attached units are centered around a courtyard designed in the modern rendition of classic Hollywood, with lush surroundings including a pool, spa and lounging deck. Other amenities include 13,700 s.f. of retail space. Parking is provided in a three-level below-grade structure accommodating 348 residential and 117 retail spaces. SL Residential was responsible for re-engaging the local stakeholder’s community and building relationships with the City jurisdictions to create a seamless transition for the re-start of construction on a project site that had been dormant for over 1.5 years. The scope of work for SL Residential also included due diligence of existing construction and building systems, determination of compliance with permitted plans, identifying and correcting all construction defects, in addition to developing an appropriate scope of work, buying out relevant trades and managing the construction and delivery of the completed community.